Kremlin insiders report that fear for survival is now sweeping the Kremlin and the ministries of the Russian government, as it is acknowledged by senior officials that President Vladimir Putin (lead image, left) will make “significant changes” when he announces the new government after his inauguration in six weeks’ time. The sources are guarded in their predictions. They believe Dmitry Medvedev will be reappointed prime minister. They expect that senior officials regarded as too fond of the west will go. 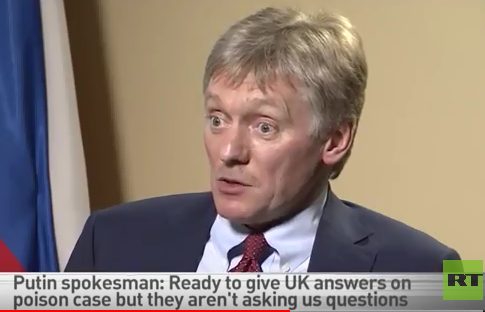 Watch and read as Dmitry Peskov explains to his boss why he should not be dismissed, and in the process reveals to the British government how the spokesman makes the president look culpable in the Skripal affair — an affair Peskov calls an “accident” six times over. 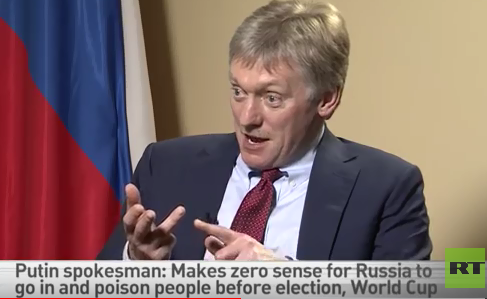 That’s a dramatic news-breaking term; Peskov fails to explain it. 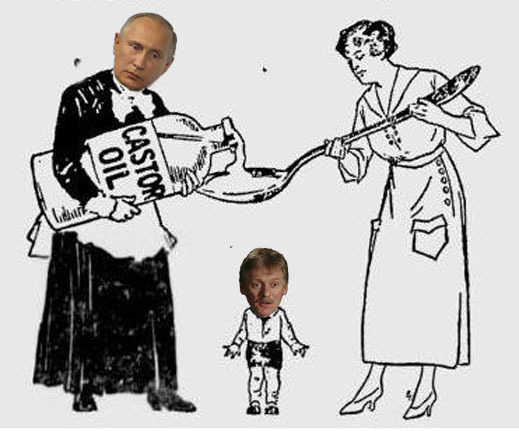 Peskov, 50, comes from a Soviet Foreign Ministry family. He started there himself in 1990, rising slowly through the ranks to First Secretary. Eight years — all of his foreign posting time — he spent in Turkey. 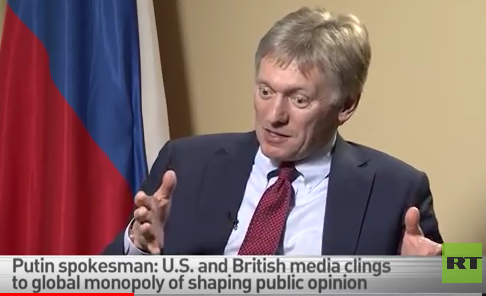 Peskov then started as a press officer in the Kremlin in 2000; he has been Putin’s spokesman at the presidency and the prime ministry. His present post, which also includes the power to direct the budgets and operations of the state media, commenced in 2012. 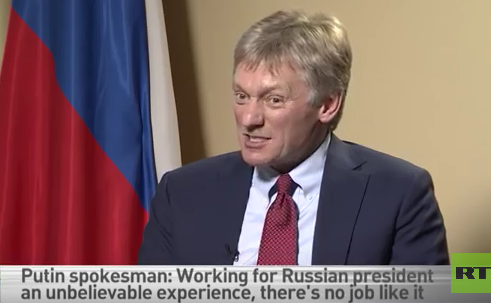 Last week Peskov summoned Russia Today Television (RT) for an unusually lengthy interview. Spoken in English, at 46 minutes it is far too long for most television viewers. 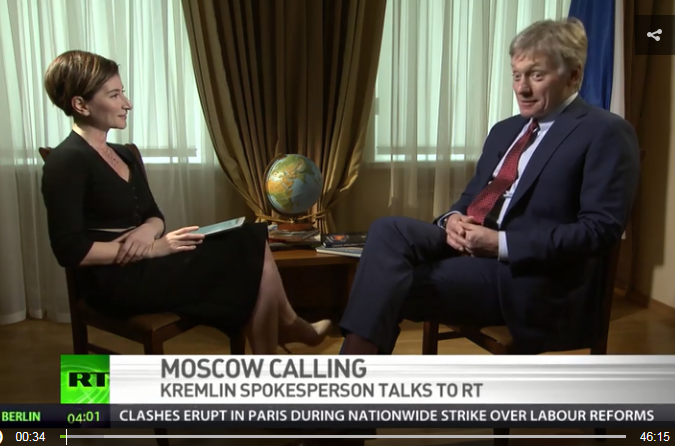 With no independent count of the RT audience and a re-broadcast estimate of 28,000 for the video clip, Peskov was appealing to the president not to remove him. Watch the video here. The transcript can also be read in full. Read these excerpts from an MI6 point of view, or from the perspective of the German Bundesnachrichtendienst (BND) or the French Direction générale de la sécurité extérieure (DGSE). They are asking themselves why Putin, with all that is now known to him of the movements, communications, and business activities of Yulia Skripal in Moscow and her father in England, would direct Peskov to say these things, but omit to explain the Russian evidence for the “accident”. 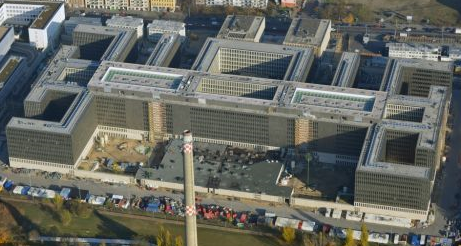 The headquarters of the BND in Berlin, constructed on the site of the German Democratic Republic’s World Youth Stadium.